Lendlease sold all 391 apartments of the third and final stage of its Darling Square apartments on Saturday, collecting about $460 million. In a four-hour frenzy, a mostly domestic group of 400 buyers, who started turning up from 8am, scooped up the apartments priced between $630,000 and $3.5 million. “This time around there were a substantial increase in domestic buyers. People see the market in quite strong conditions,” CBRE director of residential projects Murray Wood said. The glaring difference with this round, compared to the first andd second stage sellouts in 2014 and 2015, was the absence of foreign buyers. It is understood that nearly all the buyers were local, many retuning from earlier rounds. There were also strict identity and background checks, some buyers reported. “People talk about the Chinese buyers pushing up prices, but now we know it’s domestic buyers who are also doing that,” another CBRE agent said. Not seeing any “cooling” in the market, many buyers were determined not to miss out. Some even demanded an apartment, the agent added. “I have clients who missed out to years ago who told me they were not leaving until they get to buy an apartment,” he said. But some of his clients who braved the cold on Saturday morning still went away disappointed, either having missed out or not buying the apartment of their choice. “The residential market in the core CBD is still very undersupplied. At the moment, there are less than 25 apartments that can be bought off the plan,” CBRE residential director Justin Brown said. Darling Square’s appeal lies in its core CBS location, next to Chinatown and in the middle of Darling Harbour. The 1500-apartment development, which includes student accommodation, commercial and retail space and a work hub for developing ideas, has everything at its doorstep including the new entertainment, convention and exhibition precinct and Barangaroo a short walk away. 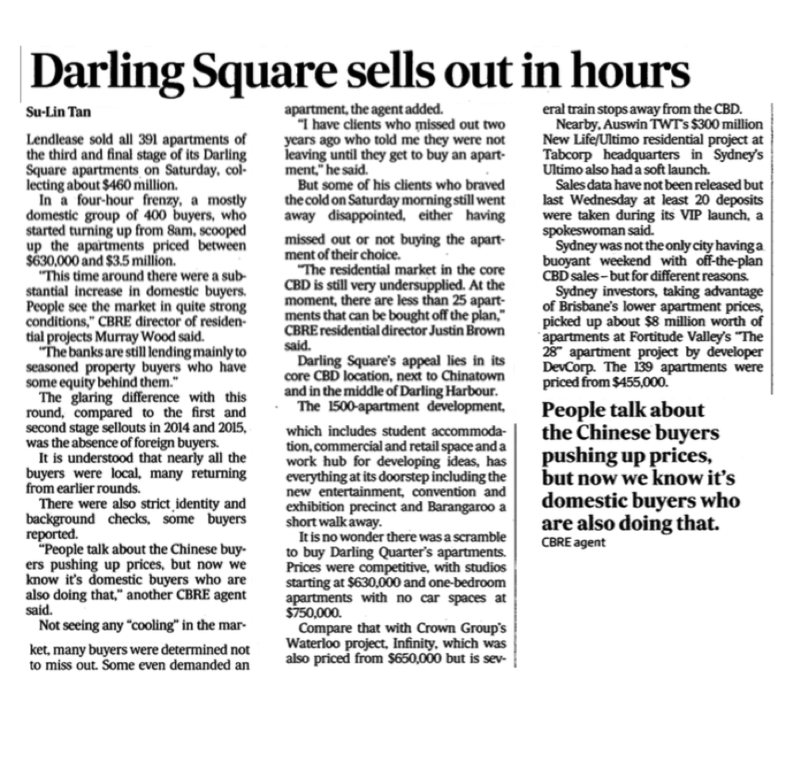 It is no wonder there was a scramble to buy Darling Quarter’s apartments. Prices were competitive, with studios starting at $630,000 and one-bedroom apartments with no car spaces at $750,000. Compare that with Crown Group’s Waterloo project, Infinity, which was also priced from $650,000 but is several train stops away from the CBD. Nearby, Auswin TWT’s $300 mill New Life/Ultimo residential project at Tabcorp headquarters in Sydney’s Ultimo also had a soft launch. Sales data have not been released but last Wednesday at least 20 deposits wee taken during its VIP launch, a spokeswoman said. Sydney was not the only city having a buoyant weekend with off-the-plan CBD sales – but for different reasons. Sydney investors, taking advantage of Brisbane’s lower apartment prices, picked up about $8 million worth of apartments at Fortitude Valley’s “The 28” apartment project by developer DevCorp. The 139 apartments were priced from $455,000.